Monopolistic competitive market produces heterogeneous products. Each monopolistic competitive firm independently fix the terms of exchange for its product. Each firm feels free to set its prices. In general, two sources of inefficiency are there in monopolistic competition. First, at optimum output the firm charges a price which exceeds marginal costs. The firm in this type of market structure maximizes its profit where marginal revenue will be equal to marginal cost. Examples of monopolistic competitive are Toothpaste, washing powder and packaged coffee. Barriers to entry are high. Oligopolists have perfect knowledge of market. Oligopoly is the market where a minimum number of firms enter in the competition and the entry for any new one is completely restricted. It depends on the potential of the firm how they take part in the competition to make the market more competitive, interactive and energetic as well. In case, the interaction is much better and stronger than competition, the charges will be above marginal cost to earn higher profits. Some firms in oligopolistic type of market structure compete aggressively and some cooperate with each other. They don’t care if they make lower profit. How do oligopolistic type of firms decide on production output and the variation of price levels is something which we need to know. These decisions are somewhat complicated as the reactions of rivals are needed to be calculated first. To understand this type of markets, we must know the concepts of gaming and also some strategies. Products are differentiated in many trades. Because of many reasons consumers view different products and brands differently. Some like the flavor, some like the reputation of the brand and some buy the product because of consistency. To maintain this legacy towards the brand and to maintain consistency, consumers keep on buying these products even in high price. For many consumers if the price of one brand rises, they shift on to another brand. For example, if one consumer prefersColgate brand in toothpaste and another consumer prefer Pepsodent, if the price of Colgate rises, a consumer who wants to maintain the consistency will continue buying Colgate but a consumer for whom toothpaste is toothpaste will shift from Colgate to Pepsodent. In this case, the demand curve can be seen downward sloping for Colgate toothpaste which will be elastic. Firms in this kind of market structure compete with their rivals by selling differentiated goods which has substitutes but not exact substitute. We can say that elasticity of demand is large but it is not infinite. There is easy entry and exit- It is comparatively easy for firms which are new to enter the shop with their brands and for surviving firms to vacant if they are not making profits and their product fails to meet to the expectations. Here a question arises that why easy entry of firms is important. Let’s take an example to clear this point. Compare the market of toothpaste and vehicles. The market of toothpaste is monopolistically competitive as compare to the market of automobile which is better considered as an oligopoly type of market structure. It is fairly easy for different firms to produce and announce new brands of toothpaste. Certainly, this restricts the profitable of producing Colgate. In this condition, when the profits are large, it is possible that other firms also think of spending on advertising, promotion, development and production with some innovation to present new brands, this would decrease the value of market shares along with profitability of other brands with large market share. Taking the part of automobile market, it is also considered by the value of product differentiation. In this case, large-scale economies are better involved in production that makes entry of any new firms tough. We have already seen such facts when 3 major U.S. automakers company had made a large market before the entry of Japanese producers in mid 70s. Other examples of this monopolistic competition market besides the toothpaste production are shampoo, perfumes, soaps, creams, and other items available in drugstore which are sold in markets like that comes under monopolistically. The markets that comes under different sporting goods are similarly monopolistically competitive. Entry is reasonably easy; if profits are high in locality because of fewer options available, new stores will try to enter the market. Just like in the case of Monopoly, we can see the downward sloping of demand curves in monopolistic competition firms. It means that these organizations have definite monopoly power with them. Having monopoly power doesn’t mean that they are meant to make higher profits. Monopolistic competitive firms are similar to flawless competition as well to certain extent. The similarities between the two types of market structures are- free entry and the possibilities to earn profits has the appeal to new firms with rival brands. This will drive the economic revenues down to become zero. For example, just check the below figure where the graph shows equilibrium price and its output level for monopolistically competitive market. In the above Fig (a), it shows short-run equilibrium. This happens when the firm’s product is dissimilar from all its competitors. In this case, the demand curve shows downward sloping. If we consider the market’s demand curve, then it will be more steeply sloped than demand curve DRS. So, profit maximizing quantity will be found at intersection point of marginal cost curve and marginal revenue curve. If the corresponding curve is more than the value of average cost, it is possible to earn profit by the firm as shown in the shaded rectangle. In long run, profit earned by the company helps in the entry of other firms. In this case, companies introduce several competitive products to keep the sales of other companies’ downward. It is shown by downward demand curve. Fig (b) highlights the marginal cost curve and average cost curve. This curve may also move downwards in the long run. Consider that costs do not modify with time then it shows by long-run request curve tangential to the usual cost curve. Moreover, this curve also suggests that profit will be zero because it is equal to average cost. Well, the curve might shows downward sloping but the firm will have the monopoly power. This downward sloping of curve is due to the specific brand of product and entry of competitors’ firm drive the value of profit to reach zero. In some cases, the products are unique such that the organization will earn a definite amount of profit which might be in fewer amounts. Contrasting to perfect competition, in monopolistic competition, considering the fact of equilibrium price, it exceeds marginal cost. The additional unit output crosses the cost of production for the customers. If outcome were stretched to the value of where the demand curve touches the marginal cost curve, we can say that the total surplus gets increased. It is highlighted in yellow-shaded area; check the Fig(b). Well, monopoly power can create burden loss but with this monopoly power, there is an existence of monopolistically competitive markets. In the figure, we can see that output is quite downward than the average cost. So, the entry of new firms can shift the level of profit to the zero mark in both competitive and those are monopolistically competitive markets. Thus, horizontal demand curve can be seen for each firm and an excessive production might be unproductive. This incompetence is destructive for the customers. The answer to this question that is monopolistic competition is socially unwanted market structure can be find out by considering these two reason which says the answer is no. As we know, in the case of monopolistic competition type of market structure, the power of monopoly is not much. This results in loss and because the firm’s demand curves will fairly elastic, the value of average cost come closer to minimum level. Inefficiencies must be balanced so that important benefit can be dragged out from monopolistic competition that is product diversity. Many customers want to choose from wide variety of products and brands available. The profits should consider product diversity which will be large and easily overshadow the inefficiency cost which arises from downward sloping demand curves. In this type of market structure, the products may be differentiated products or may not. There are only few firms which exist and occupies for total production. As there are barriers to entry for the new firms in oligopolistic markets, firms get a chance to earn high profits in long run. Oligopoly is a dominant type of market structure. For example, the industries like- electrical equipment, automobiles, petrochemicals steel, aluminum, and computers are come under this section. Why there are barriers to entry in oligopolistic market in long run arises? Few firms finds it difficult to exist in the market with the firms who spend more for recognition of their names, advertisements, innovative technologies and this discourages new firms to enter the oligopolistic market. These are considered as a natural type of barriers which exists in markets in general. Thus, an oligopolist tries to discourage the entry of new firms. For example, an oligopolist tries to create a barrier by threatening the new firms by flooding the market and threat to decrease prices if entry took place. To manage such type of market structure is complicated because the decision regarding pricing, advertising, output and investments requires planned considerations. Few firms in case of oligopolistic competition compete with each other so they have to be more careful regarding the reactions of competitors and how the actions of firms will affect the other firms. Let’s take an example of Ford cars. Suppose that Ford decrease its price to increase the sales. They take into consideration the reactions of other auto companies. Other auto companies can react in several ways. Either they match up with the new price of Ford or else they don’t give any reactions to the new price of Ford. Another possibility can be the firms in return reaction to Ford can decrease their price more than Ford and lead the price war. Ford must be careful before making any changes to its price. We can say that before making any changes regarding setting price, undertaking promotions, planning productions, investment decisions, advertising strategies, it must determine the reactions of its rivals. These tactical considerations can be multifaceted. To consider such factors are very important to take various decisions by the manager in firm. To evaluate the reactions of rivals, skills are needed. The studying of such factors can be confusing. Managers are specially trained to examine such factors before taking any decision regarding price, output and investment. With this each firm’s profit will be equal to 0. We can see that firms are supplying at marginal cost, firm and industry profits are equal to 0. We know that in case of Monopoly, equilibrium occurs when firm go with marginal revenue is equal to marginal cost. We also know that in case of Monopolistic competition, long run equilibrium has a chance to give results when new firms make the firms profit which tends to zero. Each firm takes price or check the market demand to ignore its rival’s reactions. In an oligopolistic market, a firm fixes the price or output based partly on planned considerations. These are regarding the behavior of any of its rivals. The reaction of competitors depends on firm’s decision. Thus, the question arises that when the equilibrium takes place in this case and will it be occur? To answer these questions we can use the above equations and there are certain principles which are needed to explain the firm’s equilibrium. Keep in mind how the firms in perfect competitive market and monopolistic competitive market describe its equilibrium. When a firm is in equilibrium, it is a golden chance for them to do their best without changing the price and output. We can say that a competitive firm is in equilibrium when supply is equals to demand. Each firm does its best and performs to maximize their profit. NASH EQUILIBRIUM is something which we can apply in oligopolistic type of market structure. Nash equilibrium is a tool which helps in explaining the resting point precisely. What happen when a firm is doing well? What it thinks about its rivals? The answer is firm would consider that the rival firm is also doing well. It is natural to consider that the rival firm is also doing its best when a firm is doing well itself. It is logical to think so and this is what which gives a base for an oligopoly market. In 1951, this concept was first explained by John Nash, the mathematician. This is the reason it is called as Nash equilibrium. There are some strategic problems which is to be taken into account in this case. There is a situation in which two suppliers dominate the market for a product or service which is called Duopoly. We can start with duopoly model. In 1838, it was first introduced by French economist, Augustin Cournot. Let’s consider a firm which produces a homogeneous product and know market demand curve. Each of these firms decides how much quantity to produce and two firms implement their decision at same time. They keep into consideration the reactions of its rivals before making production decision. When deciding the value how much to produce by the firms, each of these firms treat output level of rivals as fixed. Here, we can see the Firm 1’s output decision is shown by the curve D1(0), it means the production of Firm 2 is completely zero. 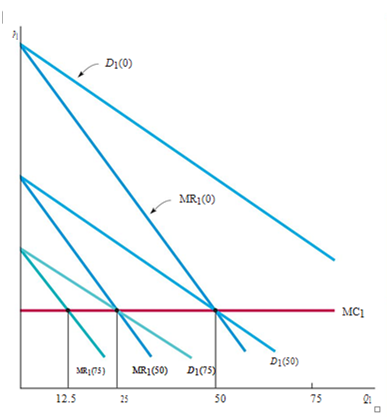 If we consider the market revenue curve MR1(0), we have to assume MC1 as the marginal cost curve for Firm 1. The profit maximizing output of the firm can be seen at 50 units where two curves i.e. market revenue curve and marginal curve intersects. Thus, it tells the value of Firm 1 to be 50 units and Firm 2 has zero units. In case, Firm 1’s output decision for Firm 2 is- Firm 2 produce 50 units. Then the plotted market demand curve gets shifted to left by numeric value 50 units. The curve D1(50) shows this curve and marginal revenue curve will be shifted to MR1(50). Similarly, when Firm 1 thinks 75 units can be produced by Firm 2, the market demand curve will be shifted to 75 which can be plotted as D1(75). Hence, he curve MR1(75) will show the marginal revenue curve for this case. If we suppose Firm 1’s output decision is 100 units of production for Firm 2, then marginal cost curve will be intersect on vertical axis (it is not shown in the above figure). Similarly, for the determination of Firm 2’s profit-maximizing quantity, it can take assumptions as before to check the capability of Firm 1’s production. The question is how much to produce by each firm? The reaction curve of each firm tells how much should be produced so that it gives the output of competitor. According to the reaction curve of its firm, the output is to be set. The equilibrium is found when the two reaction curves intersect with each other. The output levels at that point are called Cournot equilibrium. Here, each firm appropriately assumes the quantity how much its rival will produce, and how to maximize its profit as per it. Cournot model is sometimes called Nash equilibrium because it is a perfect example of Nash equilibrium. About Nash equilibrium, we can say that each firm doing well keeping in mind that their rivals are doing their best as well. And in Cournot equilibrium, each firm produces to maximize its profit. Suppose there are two firms which initially produce output levels differ from Cournot equilibrium. Is it possible to adjust their outputs till it reaches its equilibrium point? Regrettably, the Cournot model does not describes the adjustment process dynamics. It will be balanced if two firms have decided to choose their outputs at a single time then that output level cannot be changed. Let us consider two firms are in the competition. Assume antitrust laws are not considered for a certain period, it is possible that these two firms could collude. In this case, each of these firms will try to get maximum profit. So, total profit can be maximized when total output comes for equal values of marginal cost and marginal revenue. If it is advantageous to go first or not? How much will each firm produce? So producing large level of output can prove irrational and unprofitable. The Cournot and Stackelberg models are considered as the alternative representations of the oligopolistic behavior. To know which model is better depends upon the industry. In industries which have firms which are similar and strong leadership and operation exists, Cournot model will be suitable for them and in industries where introducing new and innovatve products and setting price takes place, Stackelberg model will be more appropriate. We know that an oligopolistic firm sets its price and then compete with its rivals. There are many oligopolistic industries in which competition and price setting goes side by side. Let’s take an example to explain this. Automobile companies can be a great example. These companies take price as an important variable and it decides its price by keeping in mind the reactions of the competitors. We have to use Nash equilibrium concept to study the price competition in an industry which produces homogeneous products and then industry with some point of product differentiation. Q = Total production of homogeneous good. Now, here we consider these two duopolists will compete in the market simultaneously by choosing a price not by choosing a quantity. To answer the questions like what will be the price which will be chosen by each firm and how much profit it will earn, we must note that as good is homogeneous, and consumers will prefer the low priced product only. So we can conclude that if the two firm charges different prices for their product then the firm selling low price product will be preferred by the customers and the firm which is selling products at high prices will sell nothing. If both the firm choses to sell their products in same price, there is a possibility for each firm can capture the market equally. What is the Nash equilibrium in the aforesaid case? If we think about the situation, we will get to know that because of cutting prices both firms will set price equal to marginal cost. We can say that it is a competitive outcome. We can present the situation as: P1 = P2 = $3. In this case, industry output will be given by 27 units. If each firm produces up to 13.5 units, the profit earned will be zero. This is because the price is equal to the marginal cost. We can check whether the outcome is Nash equilibrium or not. For this, just clarify whether the firms have incentives for any change in its price. In case, the Firm 1 raises the price of its product. It is possible that Firm 1 might lose the clients to Firm 2. If Firm 1 goes no reverse and lowers the price, it is possible to capture the market but the total earnings will be deteriorated. This is because of the low income statistics. In this case, it is better to highlight your activities rather than offering either higher cost or lower cost to maximize the profit. Suppose the firms are looking for similar price of product, there couldn’t be any Nash equilibrium which could help to earn profit. Moreover, a certain hike in the price might not be helpful say $5, why? This is totally because when any firm reduces the price by a little amount, it is possible to make your way towards the market feasible. The firm can even capture the market by earning double profit. For any reason if strategic choice variablesget changed from output to value, then we can get an intensely different outcome. In Cournot model, as each firm produces 9 units, the market price will be equal to $12. Here, the market price has changed to $3. The basic difference can be figured out is in Cournot model, each firm made a profit. 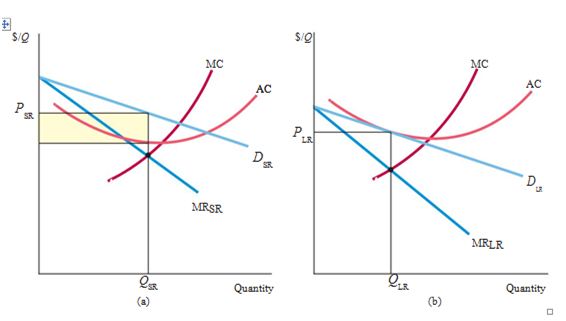 In Bertrand model, price at marginal cost will be decided by firms and hence, earn no profit. Despite these inadequacies, the Bertrand model is beneficial. This is because it indicates the equipoise output in an oligopoly how it could rely fatefully on the firms’ choice of calculated variables. Not much but Oligopolistic markets shows a certaingrade of product differentiation. Each firm’s product is examined by its design, presentation and durability not just price is considered as a factor. So it is understood to compete by selecting price instead of quantities. To know price competition with discriminated products and how it works, let’s take a simple example. Consider that these two duopolists haveits fixed costs at $20 but variable costs will be zero. How to choose a price? 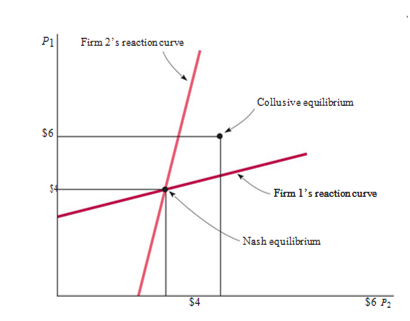 The figure shows Nash equilibrium in prices and collusive equilibrium. Finally, let us consider Firm 1 sets the price of its product by taking certain decisive steps. After looking at the Firm 1’s decisive step, Firm 2 also take a decision to set the prices.Unlike the other models such as Stackelberg model where each firm has to set quantities, here Firm 2 will be on the profitable side. This is because the Firm 1 has made the movement first. For this, determining the value of profit-maximization will be helpful (take Firm 2’s reaction curve).Why it is taken as a disadvantage to move first? Because it gives an opportunity to the firm who moves second to capture the large share of market.